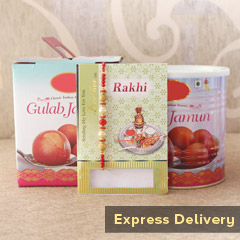 Is your dearest brother mad about Gulab Jamun sweet? 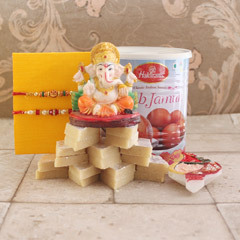 What good it can be then turning him happiest on the day of Raksha Bandhan with the thing that he loves a lot? 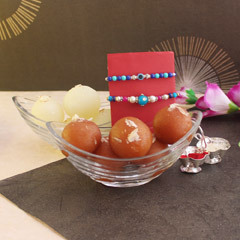 Well here we are talking about the range of Rakhi with Gulab Jamun combos that are offered below in wonderful options. You can simply explore the range to find the best option for delighting brother. Just scroll the range up and down. 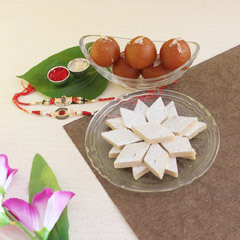 Sending you brother a Rakhi with Gulab Jamun will surely bring a smile to his face and this can be easily possible if you consider to shop from any of the online stores and plan for Raksha Bandhan despite geographical distance. 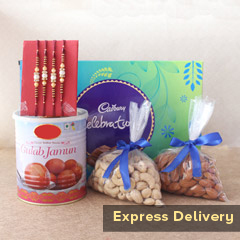 Gulab Jamuns are a much-loved sweet in India and we have always had the custom of offering sweets on special days. 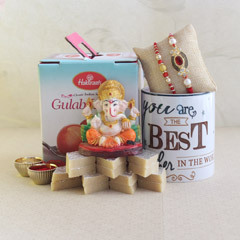 Your brother would not be expecting you to send his favorite Gulab Jamuns let alone the Rakhi on Raksha Bandhan and Sendrakhi.com will help you do exactly that. If you are upset that this year you cannot solidify the love between you and your brother because he is living far away from you, do not fret because we just made things easier. 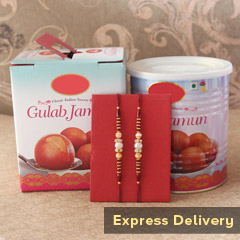 To further sweeten the affair, we will also add a box of Gulab Jamuns with your delivery. We get our sweets from the best confectioners, which is sealed, and of excellent quality, so we can assure you that he will love this gift. 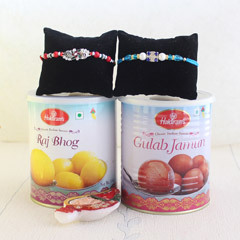 We will ship the Silver Rakhi with the Gulab Jamun within the country as well as internationally and that too free of cost. 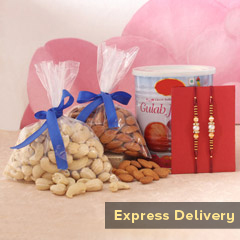 Our express delivery system is safe and quick including same-day delivery in select locations. Even if the location is outside the country, we will ensure an express and hasty delivery, so that your brother does not have to wait for too long to be surprised. 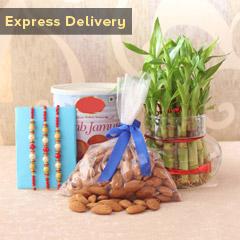 Within India, we also offer same-day delivery services.